A crowd of Soldiers, friends and family, and members of the Wiregrass community gathered to welcome a new Chief Warrant Officer of the Branch at the U.S. Army Aviation Museum here Apr. 18. CW5 Joe Roland, chief warrant officer of the Aviation Branch, assumed responsibility from CW5 Randy Godfrey, in a formal ceremony hosted by Maj. Gen. William K. Gayler, commanding general of the U.S. Army Aviation Center of Excellence and Fort Rucker. Gayler, in his opening remarks thanked the chaplain for the invocation, and commended the band for the touch of class they add. He thanked attendees, and highlighted the importance of family. "These events are all about families, and it's the opportunity for family to see and be very proud of their Soldiers," Gayler said. "We mark a bittersweet day today as we bid farewell to an outstanding chief warrant officer of the branch, Randy Godfrey and his family, and we welcome the Roland family," he said. "We're blessed to have Joe Roland and his wife Kathy, and their children Joe, Nicole and Sean join the team today," Gayler said. "I can think of no greater honor and privilege than to serve this Aviation Branch in this capacity," Roland said. 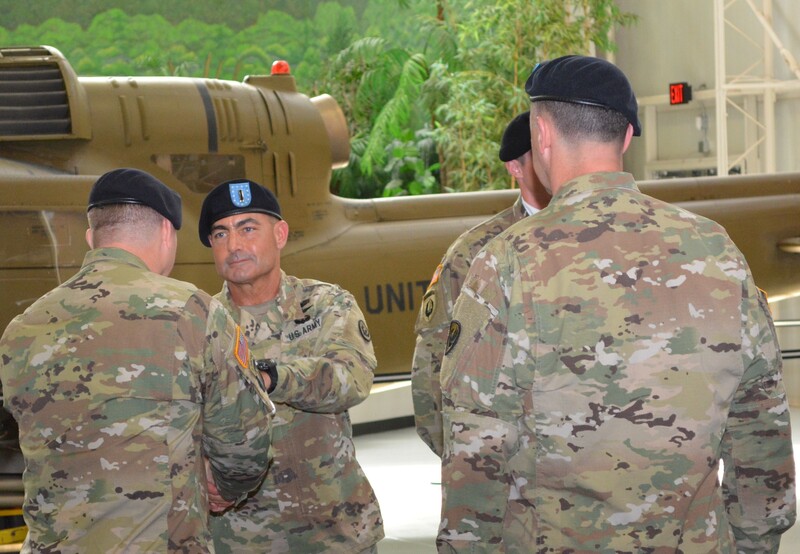 Roland, who completed his UH-60 pilot qualification and was appointed a WO1 in 1993, comes to Fort Rucker from the National Capital Region where he served as Army Aviation Standardization Officer, Deputy Chief of Staff G-3/5/7 (DAMO-AV), at the Pentagon. Roland held multiple leadership positions within the 25th Combat Aviation Brigade, Wheeler Army Airfield, Hawaii, to include serving as the Command Chief Warrant Officer of the brigade, and Standardization Instructor Pilot at the brigade, battalion and company levels. He also served as company instructor pilot for 3rd BN, 158th Aviation Regiment, 12th Aviation Brigade, Giebelstadt, Germany; and as UH60 pilot in command and flight lead for 2nd Battalion, 3rd CAB at Hunter Army Airfield, Ga.
His deployments include Operation Enduring Freedom, Operation Iraqi Freedom and New Dawn, Iraq, as well as Counter Drug and Narcotics operations in support of the Drug Enforcement Agency and the Bahamian Drug Enforcement Unit. "Your leadership, professionalism, and dedication to this branch shows no boundaries," Roland said. "As Aviation's quiet professionals, our worth is based on our deeds, not our creeds," he said. Godfrey in his remarks thanked God, the leaders and Soldiers in the audience, and family members for their support as "true patriots," and he focused on Soldiers in harm's way. "Our most important weapons systems are our Soldiers, noncommissioned officers, warrant officers, officers and civilians. The helicopters we have and the systems we operate are just the tools to do portions of our combat mission," Godfrey said. "Our world is becoming more complex every single day. We must be agile and adaptive because our enemies always will be," Godfrey said. "What are we doing for the warfighter? At the end of the day, the answer always is, we provided no fail support to the warfighter on the ground and in the air," Godfrey said. The chief warrant officer of the Aviation Branch serves as senior warrant officer for the branch, the branch chief's principal assistant and advisor on all matters concerning warrant officers and their families. The CWOB advises the branch chief on all matters pertinent to aviation warrant officer training, professional development, morale, accessions, retention and other areas impacting readiness.